In the news is the importance of smartphones in personalization and marketing initiatives, and predictions that location-based marketing could be worth $10 billion by 2018. Supermarket News discusses the rising importance of smartphones in personalization and marketing initiatives. John Caron, VP of marketing for Catalina, says that in 2014, retailers will start piloting/implementing mobile technologies and in 2015, customer mobile engagement will surge. The article also discusses some of the ways certain companies are applying customer analytics and employing mobile scanning technology and product-level personalization. 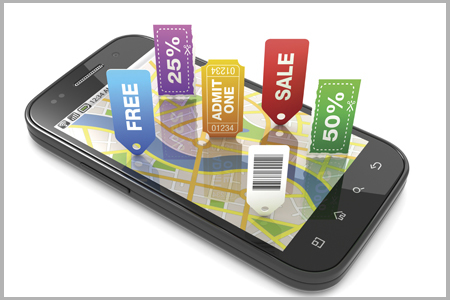 CMS Wire discusses the results of an Opus Research report entitled “Mapping the Indoor Marketing Opportunity.” According to Opus Research, location- and place-based marketing could be worth more than $10 billion annually by 2018. This kind of marketing relies heavily on smartphones, which provide customers’ locations, and can be used to provide customers with in-store push notifications. Opus Research analyst Greg Sterling, author of the report, says that “analog” spending on shelf-visibility, in-store video, and in-store coupons, will be redirected to digital and mobile. Progressive Grocer says that The Retail Industry Leaders Association (RILA) has launched an initiative to address cyber security and data privacy. Known as the RILA Cyber Security and Data Privacy Initiative, it will feature three main components. The first of these components is to strengthen overall cyber security through the formation of a council of cyber security executives to work with lawmakers on federal legislation. The second component is the elimination of magnetic-stripe technology in favor of PIN and chip cards. The initiative will also address consumer privacy concerns by clarifying how shoppers’ data is used. Will EMV Cards Be The Future Of Data Security? According to Convenience Store News, experts continue to debate over whether Europay, MasterCard, and Visa (EMV)-based credit cards could have prevented the recent data breaches. However, a recent webinar presented by the EMV Migration Forum argues that EMV cards are superior and more secure than magnetic swipe cards. While swipe cards are easily cloned, EMV card chips allow for a risk assessment during a POS transaction and contain an authentication code. Randy Venderhoof, president of the EMV Migration Forum, says the goal is to have POS terminals prepped for EMV by October 2015. The grocery industry has seen declines because of consumers increased spending on generic and discounted items during the recession, IBISWorld says. Coming out of the recession, grocery sales continued to decrease because customers turned spending back towards restaurants through 2011 and 2012. However, within the next five years, IBISWorld expects demand to increase and more customers to turn back to private label and premium brands. These slight increases will, in turn, generate a steady stream of revenue for grocery stores. CNN Money discusses the logistics behind various companies’ one-click grocery delivery programs. Some grocery shipping companies rely on customized mapping software that enables delivery services to handle traffic patterns, weather and street closures. Others rely on tablet applications to organize orders and warehouses broken into climate zones to control freshness. Convenience Store Decisions shares social media consultant Neal Schaffer’s 11 essential components for all social media strategies. Some of these components include: branding, curating, frequency, listening, crisis management, and brand ambassadors. CSPnet says that the convenience store count increased by more than 2,000 stores in the last year. This was a 1.4 percent increase, which took the total number of U.S. c-stores to 151,282. Over the last three decades, the convenience store industry has doubled in size and accounts for roughly 34 percent of all U.S. retail outlets. For more news and insights, visit BSMinfo’s POS & Payment Processing Tech Center.